Welcome to Fantasia Adventure Holidays. 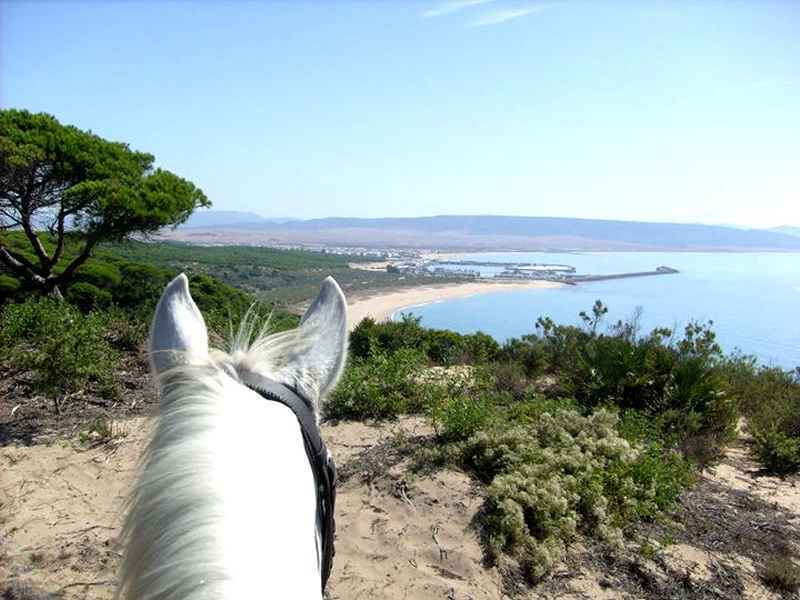 Located on the beautiful Costa de la Luz we provide superb riding on one of Spain's last unspoilt coastlines. Having lived here running equestrian holidays for over 20 years, we offer some of the best riding available. With high quality hotel accommodation and our fit, well schooled and responsive horses, our holidays are at the highest standard. While here you will experience golden beaches and tranquil pine forests with fantastic panoramic views. 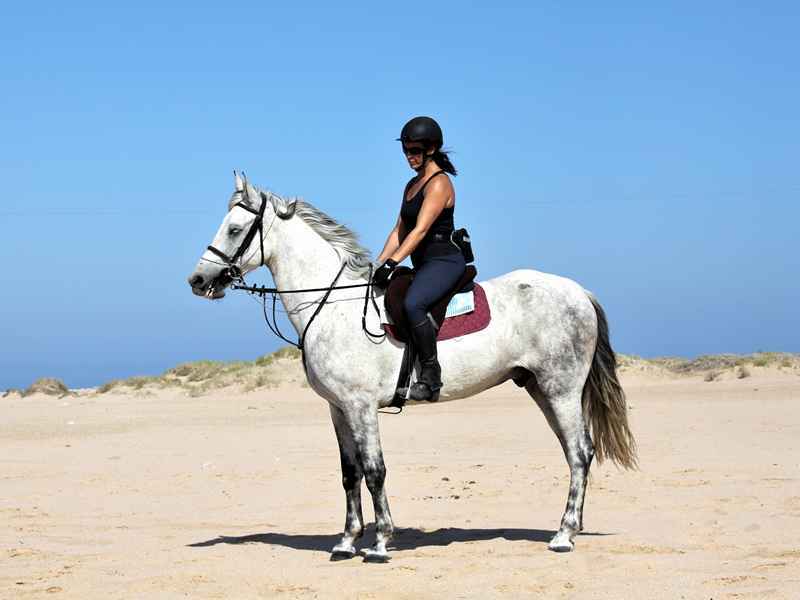 All our rides include lovely canters along sandy forest tracks, unforgettable gallops along forest firebreaks, and fantastic beach canters and gallops on beach riding days. Of course this is only part of the story as there is plenty of time to relax and enjoy the peacefulness of the forest and beaches while meandering along on your horse. You will leave us with many wonderful memories and a few extra friends. 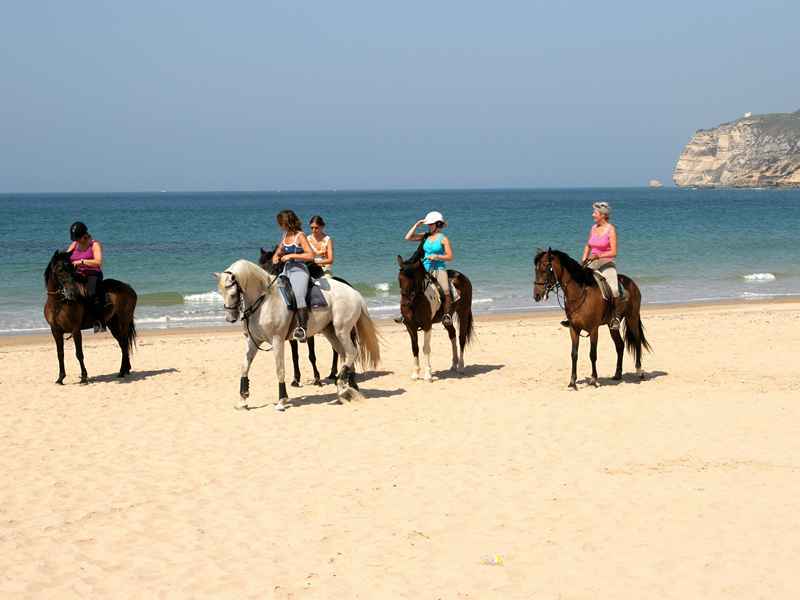 The Costa de la Luz is a perfect destination for horse holidays, with national parks and unspoilt beaches to ride on. We are located at the centre of a large, pine forested nature reserve, called Parque Natural de La Breña de Barbate. The pine forest is cool and shady, ideal for the warm summers that we have here. Beach riding days are a dream come true, with expanses of golden sand stretching out before you. With warm summers and mild winters the region is an all year round destination. During summer you can sunbathe from May to October, with only t-shirts being required day and night. The winter sun is cooler with pullovers during the day and a warm jacket at night. Our equestrian packages are for riders that can control a horse out of doors at canter. Non-riders are welcome, and there is plenty to see and do in the area. Our holidays use the luxurious, friendly and welcoming 3* Hotel Adiafa only 50 metres from the beach. The hotel has great facilities, with some rooms having a balcony with sea view, ideal for relaxing on after horse riding. Barbate is a lovely town with a beautiful seafront and in the town centre there are many shops to enjoy walking around. Evening meals are taken in typical Spanish restaurants that provide tasty Spanish cuisine, and after the meal you can relax in one of the bars on the seafront. Your English hosts and guides are ourselves, Steve and Caroline, and we ensure that guests are well looked after. We have a superb collection of pure bred Andalusian and Andalusian crosses. Well trained, responsive and a joy to ride. "I had no idea it was going to be so good. It is a memory that will stay with me forever. I don't think riding anywhere else will ever compare." Choice of Three Centre Based Riding Holidays. 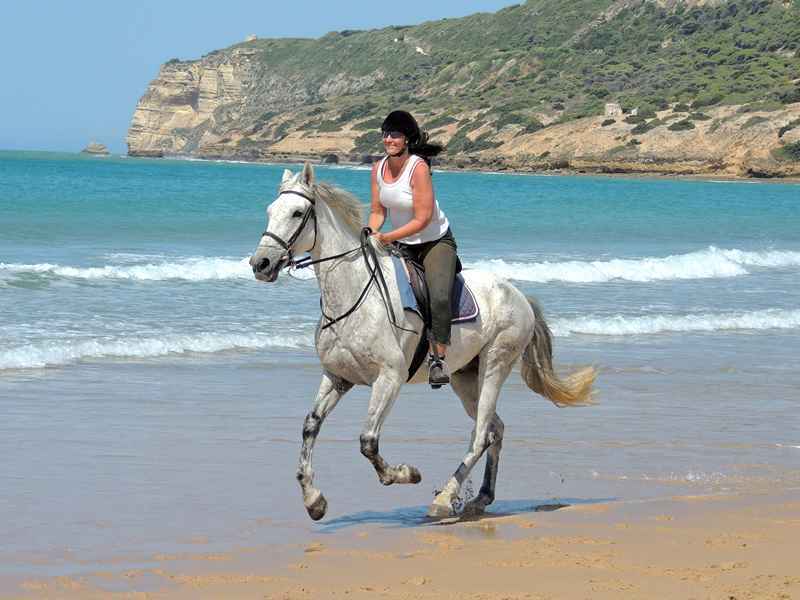 Visit unspoilt Andalusia and enjoy our value for money off road horse riding holidays. You can choose a full board package staying in a luxury 3* sea front hotel, or our self catering option. Our help and ride holiday provides a longer holiday in a comfortable sea front apartment, more details can be found here. Why not browse our photo gallery and see our horses and guests in this beautiful part of Spain. Eight Day Full Board Package. Come and join us on our full board eight day holiday in Spain. The riding is excellent with fit and responsive horses, and you will be left with fantastic memories of unspoilt beaches and a forested national park. Our holiday is a stress free group affair and in the evening you can relax and socialise in the company of the other guests. Eight day Horse Riding Holidays run Sunday to Sunday. Five full day rides with two of them on the beach. One Free day with optional excursion to the Royal Spanish Riding School. Five Day Full Board package. Our full board five day holiday is a perfect solution for those restricted to just a weekend break. With short flights available from most airports in the UK and Europe you are able to make the most of your time away in Spain. 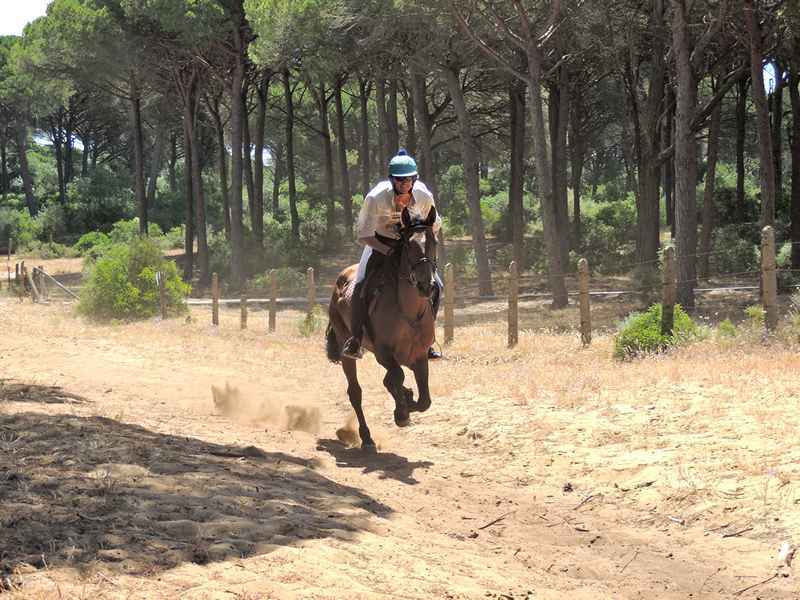 Enjoy riding our well schooled Spanish horses along golden beaches and through a tranquil pine forest with superb views of the area. After dinner you can relax in bars overlooking the beautiful beach at Barbate with the company of our other guests. Horse Riding Short Break runs Wednesday to Sunday. Three full day rides with one day on the beach. 15 Day Help & Ride Holidays. Our two week help and ride holidays are a great way of enjoying riding with us. During your time here you will enjoy superb riding and the wonderful Spanish climate. We are all very experienced equestrians here, with a large pool of knowledge to share. As well as enjoying your time in Spain at a very economical rate, you will also gain a practical knowledge of horse care. 15 day help and ride package starts and finishes on Sundays. Ten days helping us exercise our horses. At least one full day ride on the beach. Three free days to explore the area. There is plenty to do in the area for non riders especially with a hire car. The historic town of Vejer de la Frontera is only 11kms away. Los Caños de Meca and Cape Trafalgar are well worth a visit and Cadiz is only an hours drive away. If a more active non riding holiday is required, walking in the national park is wonderful, bike hire is available, scuba diving courses can be arranged and golf is available just up the road at Montenmedio. On those days where relaxing is all that is wanted there is always the beach at Barbate. 3 star Hotel accommodation overlooking the beach. No single room supplement low and mid season dates. Well schooled and responsive horses. Your guide is English and also speaks Spanish. Transfers at our stated times from and to Malaga airport. Booking our holidays is easy. Send us an email and we'll reply the same day. Payment is easy by credit / debit card. Please visit the rest of our website to find out more about our horses, accommodation and the holidays in general.